A grow light or plant light is an artificial light source, generally an electric light, designed to stimulate plant growth by emitting a light appropriate for photosynthesis. Grow lights are used in applications where there is either no naturally occurring light, or where supplemental light is required. For example, in the winter months when the available hours of daylight may be insufficient for the desired plant growth, lights are used to extend the time the plants receive light. If plants do not receive enough light, they will grow long and spindly. Russian botanist Andrei Famintsyn was the first to use artificial light for plant growing and research (1868). Grow lights are used for horticulture, indoor gardening, plant propagation and food production, including indoor hydroponics and aquatic plants. Although most grow lights are used on an industrial level, they can also be used in households. According to the inverse-square law, the intensity of light radiating from a point source (in this case a bulb) that reaches a surface is inversely proportional to the square of the surface’s distance from the source (if an object is twice as far away, it receives only a quarter the light) which is a serious hurdle for indoor growers, and many techniques are employed to use light as efficiently as possible. Reflectors are thus often used in the lights to maximize light efficiency. Plants or lights are moved as close together as possible so that they receive equal lighting and that all light coming from the lights falls on the plants rather than on the surrounding area. 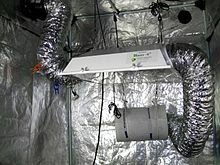 Example of an HPS grow light set up in a grow tent. The setup includes a carbon filter to remove odors, and ducting to exhaust hot air using a powerful exhaust fan. A range of bulb types can be used as grow lights, such as incandescents, fluorescent lights, high-intensity discharge lamps (HID), and light-emitting diodes (LED). Today, the most widely used lights for professional use are HIDs and fluorescents. Indoor flower and vegetable growers typically use high-pressure sodium (HPS/SON) and metal halide (MH) HID lights, but fluorescents and LEDs are replacing metal halides due to their efficiency and economy. Metal halide lights are regularly used for the vegetative phase of plant growth, as they emit larger amounts of blue and ultraviolet radiation. With the introduction of ceramic metal halide lighting and full-spectrum metal halide lighting, they are increasingly being utilized as an exclusive source of light for both vegetative and reproductive growth stages. Blue spectrum light may trigger a greater vegetative response in plants. High-pressure sodium lights are also used as a single source of light throughout the vegetative and reproductive stages. As well, they may be used as an amendment to full-spectrum lighting during the reproductive stage. Red spectrum light may trigger a greater flowering response in plants. If high-pressure sodium lights are used for the vegetative phase, plants grow slightly more quickly, but will have longer internodes, and may be longer overall. In recent years LED technology has been introduced into the grow light market. By designing an indoor grow light using diodes, specific wavelengths of light can be produced. NASA has tested LED grow lights for their high efficiency in growing food in space for extraterrestrial colonization. Findings showed that plants are affected by light in the red, green and blue parts of the visible light spectrum. While fluorescent lighting used to be the most common type of indoor grow light, HID lights are now the most popular. High intensity discharge lamps have a high lumen-per-watt efficiency. There are several different types of HID lights including mercury vapor, metal halide, high pressure sodium and conversion bulbs. Metal halide and HPS lamps produce a color spectrum that is somewhat comparable to the sun and can be used to grow plants. Mercury vapor lamps were the first type of HIDs and were widely used for street lighting, but when it comes to indoor gardening they produce a relatively poor spectrum for plant growth so they have been mostly replaced by other types of HIDs for growing plants. All HID grow lights require a ballast to operate, and each ballast has a particular wattage. Popular HID wattages include 150W, 250W, 400W, 600W and 1000W. Of all the sizes, 600W HID lights are the most electrically efficient as far as light produced, followed by 1000W. A 600W HPS produces 7% more light (watt-for-watt) than a 1000W HPS. Although all HID lamps work on the same principle, the different types of bulbs have different starting and voltage requirements, as well as different operating characteristics and physical shape. Because of this a bulb won’t work properly unless it’s using a matching ballast, even if the bulb will physically screw in. In addition to producing lower levels of light, mismatched bulbs and ballasts will stop working early, or may even burn out immediately. Metal halide bulbs are a type of HID light that emit light in the blue and violet parts of the light spectrum, which is similar to the light that is available outdoors during spring. Because their light mimics the color spectrum of the sun, some growers find that plants look more pleasing under a metal halide than other types of HID lights such as the HPS which distort the color of plants. 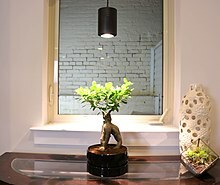 Therefore, it’s more common for a metal halide to be used when the plants are on display in the home (for example with ornamental plants) and natural color is preferred. Metal halide bulbs need to be replaced about once a year, compared to HPS lights which last twice as long. Metal halide lamps are widely used in the horticultural industry and are well-suited to supporting plants in earlier developmental stages by promoting stronger roots, better resistance against disease and more compact growth. The blue spectrum of light encourages compact, leafy growth and may be better suited to growing vegetative plants with lots of foliage. A metal halide bulb produces 60-125 lumens/watt, depending on the wattage of the bulb. They are now being made for digital ballasts in a pulse start version, which have higher electrical efficiency (up to 110 lumens per watt) and faster warmup. One common example of a pulse start metal halide is the ceramic metal halide (CMH). Pulse start metal halide bulbs can come in any desired spectrum from cool white (7000 K) to warm white (3000 K) and even ultraviolet-heavy (10,000 K). Ceramic metal halide (CMH) lamps are a relatively new type of HID lighting, and the technology is referred to by a few names when it comes to grow lights, including ceramic discharge metal halide (CDM), ceramic arc metal halide. Ceramic metal halide lights are started with a pulse-starter, just like other “pulse-start” metal halides. The discharge of a ceramic metal halide bulb is contained in a type of ceramic material known as polycrystalline alumina (PCA), which is similar to the material used for an HPS. PCA reduces sodium loss, which in turn reduces color shift and variation compared to standard MH bulbs. Horticultural CDM offerings from companies such as Philips have proven to be effective sources of growth light for medium-wattage applications. Combination HPS/MH lights combine a metal halide and a high-pressure sodium in the same bulb, providing both red and blue spectrums in a single HID lamp. The combination of blue metal halide light and red high-pressure sodium light is an attempt to provide a very wide spectrum within a single lamp. This allows for a single bulb solution throughout the entire life cycle of the plant, from vegetative growth through flowering. There are potential tradeoffs for the convenience of a single bulb in terms of yield. There are however some qualitative benefits that come for the wider light spectrum. An HPS (High Pressure Sodium) grow light bulb in an air-cooled reflector with hammer finish. The yellowish light is the signature color produced by an HPS. High-pressure sodium lights are a more efficient type of HID lighting than metal halides. HPS bulbs emit light in the yellow/red visible light as well as small portions of all other visible light. Since HPS grow lights deliver more energy in the red part of the light spectrum, they may promote blooming and fruiting. They are used as a supplement to natural daylight in greenhouse lighting and full-spectrum lighting(metal halide) or, as a standalone source of light for indoors/grow chambers. HPS grow lights are sold in the following sizes: 150W, 250W, 400W, 600W and 1000W. Of all the sizes, 600W HID lights are the most electrically efficient as far as light produced, followed by 1000W. A 600W HPS produces 7% more light (watt-for-watt) than a 1000W HPS. An HPS bulb produces 60-140 lumens/watt, depending on the wattage of the bulb. Plants grown under HPS lights tend to elongate from the lack of blue/ultraviolet radiation. Modern horticultural HPS lamps have a much better adjusted spectrum for plant growth. The majority of HPS lamps while providing good growth, offer poor color rendering index (CRI) rendering. As a result, the yellowish light of an HPS can make monitoring plant health indoors more difficult. CRI isn’t an issue when HPS lamps are used as supplemental lighting in greenhouses which make use of natural daylight (which offsets the yellow light of the HPS). High-pressure sodium lights have a long usable bulb life, and six times more light output per watt of energy consumed than a standard incandescent grow light. Due to their high efficiency and the fact that plants grown in greenhouses get all the blue light they need naturally, these lights are the preferred supplemental greenhouse lights. But, in the higher latitudes, there are periods of the year where sunlight is scarce, and additional sources of light are indicated for proper growth. HPS lights may cause distinctive infrared and optical signatures, which can attract insects or other species of pests; these may in turn threaten the plants being grown. High-pressure sodium lights emit a lot of heat, which can cause leggier growth, although this can be controlled by using special air-cooled bulb reflectors or enclosures. Conversion bulbs are manufactured so they work with either a MH or HPS ballast. A grower can run an HPS conversion bulb on a MH ballast, or a MH conversion bulb on a HPS ballast. The difference between the ballasts is an HPS ballast has an igniter which ignites the sodium in an HPS bulb, while a MH ballast does not. Because of this, all electrical ballasts can fire MH bulbs, but only a Switchable or HPS ballast can fire an HPS bulb without a conversion bulb. Usually a metal halide conversion bulb will be used in an HPS ballast since the MH conversion bulbs are more common. A switchable ballast is an HID ballast can be used with either a metal halide or an HPS bulb of equivalent wattage. So a 600W Switchable ballast would work with either a 600W MH or HPS. Growers use these fixtures for propagating and vegetatively growing plants under the metal halide, then switching to a high-pressure sodium bulb for the fruiting or flowering stage of plant growth. To change between the lights, only the bulb needs changing and a switch needs to be set to the appropriate setting. In tests conducted by Philips Lighting on LED grow lights to find an optimal light recipe for growing various vegetables in greenhouses, they found that the following aspects of light affects both plant growth (photosynthesis) and plant development (morphology): light intensity, total light over time, light at which moment of the day, light/dark period per day, light quality (spectrum), light direction and light distribution over the plants. However it’s noted that in tests between tomatoes, mini cucumbers and bell peppers, the optimal light recipe was not the same for all plants, and varied depending on both the crop and the region, so currently they must optimize LED lighting in greenhouses based on trial and error. They’ve shown that LED light affects disease resistance, taste and nutritional levels, but as of 2014 they haven’t found a practical way to use that information. To prevent leaf burn, LED grow lights should be kept between 12 inches (30 cm) away from plants for lower wattage lamps (under 300 watts) up to 36 inches (91 cm) away from plants for higher wattage lamps (1000 watts or more). Historically, LED lighting was very expensive, but costs have greatly reduced over time, and their longevity has made them more popular. LED grow lights are often priced higher, watt-for-watt, than other LED lighting, due to design features that help them to be more energy efficient and last longer. In particular, because LED grow lights are relatively high power, LED grow lights are often equipped with cooling systems, as low temperature improves both the brightness and longevity. LEDs usually last for 50,000 – 90,000 hours until LM-70 is reached. Fluorescent lights come in many form factors, including long, thin bulbs as well as smaller spiral shaped bulbs (compact fluorescent lights). Fluorescent lights are available in color temperatures ranging from 2700 K to 10,000 K. The luminous efficacy ranges from 30 lm/W to 90 lm/W. The two main types of fluorescent lights used for growing plants are the tube-style lights and compact fluorescent lights. Fluorescent grow lights are not as intense as HID lights and are usually used for growing vegetables and herbs indoors, or for starting seedlings to get a jump start on spring plantings. A ballast is needed to run these types of fluorescent lights. Standard fluorescent lighting comes in multiple form factors, including the T5, T8 and T12. The brightest version is the T5. The T8 and T12 are less powerful and are more suited to plants with lower light needs. High-output fluorescent lights produce twice as much light as standard fluorescent lights. A high-output fluorescent fixture has a very thin profile, making it useful in vertically limited areas. Fluorescents have an average usable life span of up to 20,000 hours. A fluorescent grow light produces 33-100 lumens/watt, depending on the form factor and wattage. Compact Fluorescent lights (CFLs) are smaller versions of fluorescent lights that were originally designed as pre-heat lamps, but are now available in rapid-start form. CFLs have largely replaced incandescent light bulbs in households because they last longer and are much more electrically efficient. In some cases, CFLs are also used as grow lights. Like standard fluorescent lights, they are useful for propagation and situations where relatively low light levels are needed. While standard CFLs in small sizes can be used to grow plants, there are also now CFL lamps made specifically for growing plants. Often these larger compact fluorescent bulbs are sold with specially designed reflectors that direct light to plants, much like HID lights. Common CFL grow lamp sizes include 125W, 200W, 250W and 300W. Unlike HID lights, CFLs fit in a standard mogul light socket and don’t need a separate ballast. Compact fluorescent bulbs are available in warm/red (2700 K), full spectrum or daylight (5000 K) and cool/blue (6500 K) versions. Warm red spectrum is recommended for flowering, and cool blue spectrum is recommended for vegetative growth. Usable life span for compact fluorescent grow lights is about 10,000 hours. A CFL produces 44-80 lumens/watt, depending on the wattage of the bulb. A cold cathode is a cathode that is not electrically heated by a filament. A cathode may be considered “cold” if it emits more electrons than can be supplied by thermionic emissionalone. It is used in gas-discharge lamps, such as neon lamps, discharge tubes, and some types of vacuum tube. The other type of cathode is a hot cathode, which is heated by electric current passing through a filament. A cold cathode does not necessarily operate at a low temperature: it is often heated to its operating temperature by other methods, such as the current passing from the cathode into the gas. Natural daylight has a high color temperature (approximately 5000-5800 K). Visible light color varies according to the weather and the angle of the Sun, and specific quantities of light (measured in lumens) stimulate photosynthesis. Distance from the sun has little effect on seasonal changes in the quality and quantity of light and the resulting plant behavior during those seasons. The axis of the Earth is not perpendicular to the plane of its orbit around the sun. During half of the year the north pole is tilted towards sun so the northern hemisphere gets nearly direct sunlight and the southern hemisphere gets oblique sunlight that must travel through more atmosphere before it reaches the Earth’s surface. In the other half of the year, this is reversed. The color spectrum of visible light that the sun emits does not change, only the quantity (more during the summer and less in winter) and quality of overall light reaching the Earth’s surface. Some supplemental LED grow lights in vertical greenhouses produce a combination of only red and blue wavelengths. The color rendering index facilitates comparison of how closely the light matches the natural color of regular sunlight. There have been several experiments using LEDs to grow plants, and it has been shown that plants need both red and blue light for healthy growth. From experiments it has been consistently found that the plants that are growing only under LEDs red (660 nm, long waves) spectrum growing poorly with leaf deformities, though adding a small amount of blue allows most plants to grow normally. Several reports suggest that a minimum blue light requirement of 15-30 µmol·m−2·s−1 is necessary for normal development in several plant species. The National Aeronautics and Space Administration’s (NASA) Biological Sciences research group has concluded that light sources consisting of more than 50% green cause reductions in plant growth, whereas combinations including up to 24% green enhance growth for some species. Green light has been shown to affect plant processes via both cryptochrome-dependent and cryptochrome-independent means. Generally, the effects of green light are the opposite of those directed by red and blue wavebands, and it’s speculated that green light works in orchestration with red and blue. A plant’s specific needs determine which lighting is most appropriate for optimum growth. If a plant does not get enough light, it will not grow, regardless of other conditions. 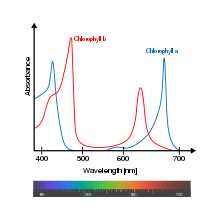 Most plants use chlorophyll which mostly reflects green light, but absorbs red and blue light well. Vegetables grow best in strong sunlight, and to flourish indoors they need sufficient light levels, whereas foliage plants (e.g. Philodendron) grow in full shade and can grow normally with much lower light levels. Grow lights usage is dependent on the plant’s phase of growth. Generally speaking, during the seedling/clone phase, plants should receive 16+ hours on, 8- hours off. The vegetative phase typically requires 18 hours on, and 6 hours off. During the final, flower stage of growth, keeping grow lights on for 12 hours on and 12 hours off is recommended. In addition, many plants also require both dark and light periods, an effect known as photoperiodism, to trigger flowering. Therefore, lights may be turned on or off at set times. The optimum photo/dark period ratio depends on the species and variety of plant, as some prefer long days and short nights and others prefer the opposite or intermediate “day lengths”. Much emphasis is placed on photoperiod when discussing plant development. However, it is the number of hours of darkness that affects a plant’s response to day length. In general, a “short-day” is one in which the photoperiod is no more than 12 hours. A “long-day” is one in which the photoperiod is no less than 14 hours. Short-day plants are those that flower when the day length is less than a critical duration. Long-day plants are those that only flower when the photoperiod is greater than a critical duration. Day-neutral plants are those that flower regardless of photoperiod. Weighting factor for photosynthesis. The photon-weighted curve is for converting PPFD to YPF; the energy-weighted curve is for weighting PAR expressed in watts or joules. The spectral levels of light that can be used by plants for photosynthesis is similar to, but not the same as what’s measured by lumens. Therefore, when it comes to measuring the amount of light available to plants for photosynthesis, biologists often measure the amount of photosynthetically active radiation (PAR) received by a plant. PAR designates the spectral range of solar radiation from 400 to 700 nanometers, which generally corresponds to the spectral range that photosynthetic organisms are able to use in the process of photosynthesis. ^ “Are LED Grow Lights Really That Efficient?”. feedtheseeds. 2019-02-22. ^ a b c d e f Howard Resh (16 January 2013). Hobby Hydroponics, Second Edition. CRC Press. pp. 23–28. ISBN 978-1-4665-6942-3. ^ a b c d e George F. Van Patten (2002). Gardening Indoors: The Indoor Gardener’s Bible. Van Patten Publishing. pp. 47–50. ISBN 978-1-878823-31-1. ^ a b Max Clarke (13 March 2013). The Complete Guide to Building Your Own Greenhouse. Lulu.com. p. 53. ISBN 978-1-105-91367-9. ^ a b c Sue Reed (18 October 2013). Energy-Wise Landscape Design: A New Approach for Your Home and Garden. New Society Publishers. pp. 247–250. ISBN 978-1-55092-443-5. ^ a b Wayne C. Turner; Steve Doty (2007). Energy Management Handbook. The Fairmont Press, Inc. pp. 376–378. ISBN 978-0-88173-543-7. ^ a b Turner, Wayne C.; Doty, Steve (2007-01-01). Energy Management Handbook. The Fairmont Press, Inc. p. 376. ISBN 9780881735437. ^ a b c d Anil Ahuja (9 March 2013). Integrated M/E Design: Building Systems Engineering. Springer Science & Business Media. pp. 28–31. ISBN 978-1-4757-5514-5. ^ “Conversion (MH<–>HPS)”. Growers House. Growers House. Retrieved 2015-12-15. ^ “Frequently Asked Questions”. leds.hrt.msu.edu. Retrieved 2015-09-19. ^ a b c Yorio, Neil C.; Goins, Gregory D.; Kagie, Hollie R.; Wheeler, Raymond M.; Sager, John C. (2001-04-01). “Improving Spinach, Radish, and Lettuce Growth under Red Light-emitting Diodes (LEDs) with Blue Light Supplementation”. HortScience. 36 (2): 380–383. ISSN 0018-5345. ^ a b Goins, G. D.; Yorio, N. C.; Sanwo, M. M.; Brown, C. S. (1997-07-01). “Photomorphogenesis, photosynthesis, and seed yield of wheat plants grown under red light-emitting diodes (LEDs) with and without supplemental blue lighting”. Journal of Experimental Botany. 48 (312): 1407–1413. doi:10.1093/jxb/48.7.1407. ISSN 0022-0957. PMID 11541074. ^ a b c Goins, G. D.; Yorio, N. C.; Sanwo-Lewandowski, M. M.; Brown, C. S. (1998-01-01). 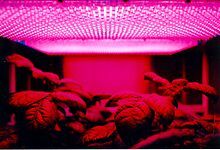 “Life cycle experiments with Arabidopsis grown under red light-emitting diodes (LEDs)”. Life Support & Biosphere Science: International Journal of Earth Space. 5 (2): 143–149. ISSN 1069-9422. PMID 11541670. ^ a b c Massa, Gioia D.; Kim, Hyeon-Hye; Wheeler, Raymond M.; Mitchell, Cary A. (2008-12-01). “Plant Productivity in Response to LED Lighting”. HortScience. 43 (7): 1951–1956. ISSN 0018-5345. ^ a b c d Kim, Hyeon-Hye; Wheeler, Raymond M.; Sager, John C.; Yorio, Neil C.; Goins, Gregory D. (2005-01-01). “Light-emitting diodes as an illumination source for plants: a review of research at Kennedy Space Center”. Habitation (Elmsford, N.Y.). 10 (2): 71–78. doi:10.3727/154296605774791232. ISSN 1542-9660. PMID 15751143. ^ a b c Kim, Hyeon-Hye; Goins, Gregory D.; Wheeler, Raymond M.; Sager, John C. (2004-12-01). “Green-light Supplementation for Enhanced Lettuce Growth under Red- and Blue-light-emitting Diodes”. HortScience. 39 (7): 1617–1622. ISSN 0018-5345. ^ Sabzalian, Mohammad R., Parisa Heydarizadeh, Morteza Zahedi, Amin Boroomand, Mehran Agharokh, Mohammad R. Sahba, and Benoît Schoefs. “High performance of vegetables, flowers, and medicinal plants in a red-blue LED incubator for indoor plant production.” Agronomy for Sustainable Development 34, no. 4 (2014): 879-886. ^ Abhay Thosar, Ph.D., Esther Hogeveen van Echtelt (July 29, 2014). LED: the New Fast-track to Growth: Recipe Development and Practical Applications in Horticulture – Part 1: Global Examples LED Recipes and Development (Video). Orlando, FL. Event occurs at 00:03:15, 00:13:05. Archived from the original on February 16, 2016. Retrieved February 12, 2015. ^ Parks, Brian M. (2003-12-01). “The Red Side of Photomorphogenesis”. Plant Physiology. 133 (4): 1437–1444. doi:10.1104/pp.103.029702. ISSN 1532-2548. PMC 1540344. PMID 14681526. ^ “Vertical ‘Pinkhouses:’ The Future Of Urban Farming?”. NPR.org. Retrieved 2016-02-08. ^ Hoenecke, M. E.; Bula, R. J.; Tibbitts, T. W. (1992-05-01). “Importance of ‘blue’ photon levels for lettuce seedlings grown under red-light-emitting diodes”. HortScience: A Publication of the American Society for Horticultural Science. 27 (5): 427–430. ISSN 0018-5345. PMID 11537611. ^ Wheeler, R. M.; Mackowiak, C. L.; Sager, J. C. (1991-10-01). “Soybean stem growth under high-pressure sodium with supplemental blue lighting”. Agronomy Journal. 83 (5): 903–906. doi:10.2134/agronj1991.00021962008300050024x. ISSN 0002-1962. PMID 11537676. ^ “Evaluation of lettuce growth using supplemental green light with red and blue light-emitting diodes in a controlled environment – a review of research at kennedy space center”. www.actahort.org. Retrieved 2016-02-12. ^ Folta, Kevin; Maruhnich, Stefanie A. (2007-09-01). “Green light: a signal to slow down or stop”. Journal of Experimental Botany. 58 (12): 3099–3111. doi:10.1093/jxb/erm130. ISSN 0022-0957. PMID 17630292. ^ a b c Hall, David O.; Rao, Krishna (1999-06-24). Photosynthesis. Cambridge University Press. pp. 8–9. ISBN 9780521644976.